Kevin Merrigan at Northrop & Johnson sends news of a further €3 million price reduction on his central listing, the 64m sailing yacht Felicita West. She was designed for an owner who wanted to create the ultimate sailing experience. Built by Perini Navi in collaboration with Ron Holland, her long waterline and 1800m² of canvas propel her to speeds in excess of 16 knots. Her ultra-wide beam of 12.7 meters brings large internal volume and side decks where two people can walk side by side, a feat few motor yachts can achieve. 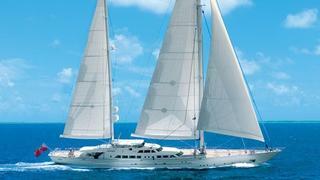 She was the first 500 tonne aluminium sailing yacht to be MCA certified. She comfortably accommodates 10 guests in a master suite, two double and two twin cabins. Twin 1400 Deutz engines give her a cruising speed of 14 knots and a range of 4,500 nautical miles at 13 knots. On display at the Monaco Yacht Show, Felicita West is now asking €25 million.